The uber-popular Philips Wake-Up Light, fitness gear, a massager Gold Box, and more are all part of today’s best deals. Whether you like to camp, or just want to be prepared for an extended post-nuclear wasteland power outage, it’s not a bad idea to own a USB solar charger. This model from RAVPower can charge three devices at once with a maximum output of 24W in ideal lighting conditions, which makes it more powerful than pretty much any other all-in-one solar charging solution out there. Use code KINJAW3F at checkout to save $16, and don’t let the sun set on this deal. Detergent pods are the easiest way to do the laundry, and with Amazon’s $3 coupon, they’re also some of the cheapest. The coupon applies a couple pod varieties from Tide and Gain, but just remember that you won’t see the discount until checkout. Update: The 8% off coupon expired but the coupon code is still working. Amazon has been tossing a couple of protein powder Gold Boxes our way, but today’s features protein cookies too. So if you haven’t already stocked up on all the stuff you need to bulk, sift through this Gold Box. 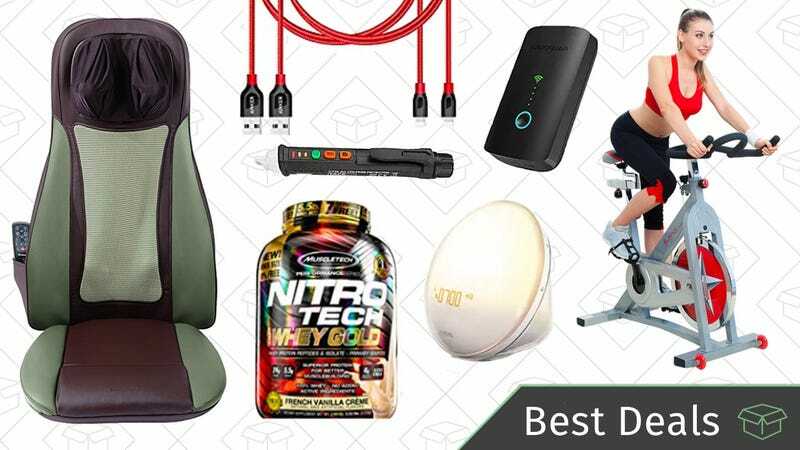 Some of the items even have coupon attached so they’re even better deals. Remember, this deal will end at the end of the day or when the products sell out, so don’t drop the ball on this. Look, we know that the Wii U isn’t the Switch, but if you have one and you love it, you can stock up on games at Target while they’re buy one, get one free. Just add two games to your cart and you’ll grab one of those games for free. Zelda, Super Mario Bros, Super Mario Maker, and more are included.